Boyfriend Jeans And A Punch of Color. I have been looking endlessly for a good pair of old loose ripped jeans AKA boyfriend jeans, finally I shopped my closet and found some old loose jeans that I’ve been hanging on to. You mean to tell me you have no old loose jeans ? Well, you see my friends I lost about 15 pounds when I met my husband and I have held on to these suckers because you never know, if you have my eating habits your weight fluctuates, but ideally I had them tucked away for when, God willing, blesses us with a little bambino! These simple jeans needed a little personality so I gave them a makeover by ripping them up and fraying the edges. I’ll post a DIY boyfriend jeans soon. As you know by now, I love to intermix my work and causal clothes on most days, I definitely get more out of my wardrobe which ,makes it that more exciting. 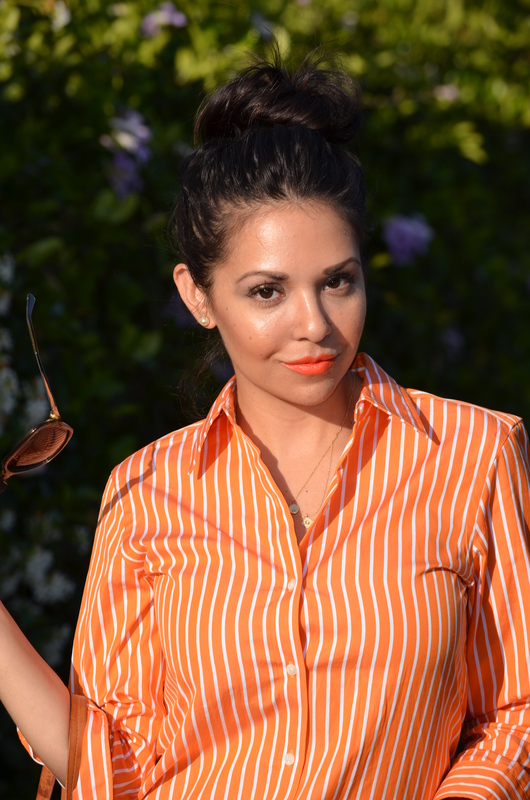 Wearing a simple loose flirty side bun with a sophisticated button up that I wear to work. Casual jeans, classic pumps that I also wear to work. Fall color purse to soften my punch of color lips and a button up with some dainty jewelry to dress up my jeans. Dainty layered necklaces. Gold lock: gift from Tiffany’s & Co. Triangle 18k gold necklace centered with a diamond from our new line!! Very nice, I esp love the shirt, bag & lippie! Thank you for stopping by, your comments are always appreciated. Love this outfit and the bag!! Thank you, it is one of my favorites.